Director: John V. Soto / Writers: Soto & Anthony Egan / Cast: Michael Dorman, Travis Fimmel, Tahyna Tozzi, Jessica Marais, Trilby Glover, Luke Carroll, Nathaniel Buzolic, Khan Chittenden, Jane Badler, John Jarratt, Ben Mendelsohn. College kid Ben Rutherford receives a bizarre antique box – the last item remaining in his late father’s will – an ornate little contraption with ‘Le Vaudou Mort’ on the top. He doesn’t want it but is told by a college professor it could hold some worth and so hides it under his bed after showing his group of school friends. When he finds the box is stolen, an event that coincides the return of his estranged police photographer brother, Ben isn’t so bothered until the mysterious fiend who has box-napped it begins using it for its created intentions: Killing. Turns out the box is used to create mini wax figurines that are used for voodoo when the desired victim’s photograph is inserted and blood and wax poured in the top. Said victim hears the cranking of the in-box mechanics before whatever wounds the assailant wishes to inflict on the victim are carried out with various needles. So it goes, the jock is first to find himself slashed to pieces from the inside out, then a wall-climber is literally broken into pieces. Ben and big-bro Marcus are forced into collaborating to work out what the box is, who has it and why their using it to take out a bunch of harmless college students. 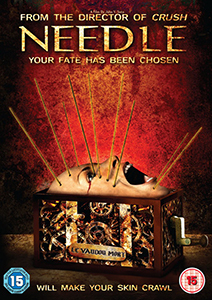 There’s morgue investigations (in which Aussie horror staple John Jarratt plays the chipper coroner), a trip to the nuthouse to see one of the few witnesses to the box’s substantial killing abilities, and eventually ye olde back-to-the-beginning where the hands-free killer and their vengeful motive is revealed. The eventual identity of the loon is revealed nicely, with gentle memories of Urban Legend and a believable “this is why I did it” jabber. Aspects of Final Destination portents-of-doom are well played; the jogger who dies first runs past several lights that short out and fizzle in the distance and there’s that underlying question of who is next to hear the crankings of death? Gore is present without being OTT and there’s a certain charm about the interplay between the brothers that you don’t often get when the lead role is a traumatised cheerleader. That said, the writing isn’t too macho to have the guys run in ready for a fight: Ben is scared to go and explore the creepy old house. A refreshing change of pace. Inject yourself with a shot of Needle, it’ll be quite the trip. Blurbs-of-interest: John Jarratt was the Mick Dundee-heavy psycho in Wolf Creek and its sequel, plus the TV series, and was also in Next of Kin.